Managing finances in a marriage can be difficult, especially when one partner is a saver and the other is a spender. According to a recent Wall Street Journal article, though, the old adage “opposites attract” has some truth to it. Individuals seek partners who complement the attributes they lack in, which is why it is not uncommon to see an outgoing personality coupled up with a more serious partner. But what happens when these two opposing personalities clash on the matter of finances? 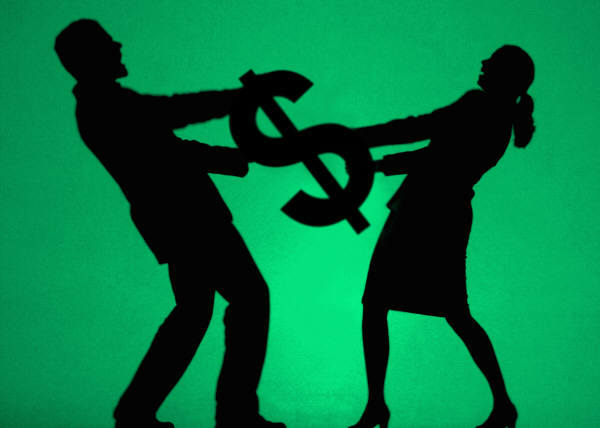 Unlike opposing personality traits, financial issues are much more difficult to dismiss, which explains why disagreement over money is listed as one of the leading causes for divorce. While we may seek the personality traits our partner displays, we may not be bargaining for their financial ways. Debt in particular can cause a sour note in a marriage and quickly turn newlywed bliss into a newlywed nightmare. So how do you manage money in a marriage without killing each other? If you’re the saver, and your partner’s the spender–whatever you do, don’t call it a budget. A budget implies negative connotations of restrictions and no more fun. A spending plan is a plan where you decide how to spend (and save) your money. Calculate your monthly income, subtract your fixed expenses (mortgage, car payment, student loans), subtract your variable expenses (groceries, fuel, etc), and whatever you have left over needs to get divided into savings accounts, retirement accounts, and fun money. Do you plan on buying a house? How much would you like to save for retirement? If one brought in more debt to the marriage, how will that be paid off? Do you agree on paying your cards in full, or are you okay with carrying a balance? What is considered a big expense? How will big expenses be managed? Do you need to ask your partner for their consideration over a $100 expense? $500? $1,000? Everybody wants to have a little fun. Allocate an allowance for each of you to spend. This money is free money–you’re able to spend it anyway you’d like. But that’s all you get for the month. The hardest part to remember (especially for the savers) is that your partner will make mistakes. And it’s impossible to stick to a spending plan 100% of the time. Emergencies arise, or sometimes maybe you just really want to celebrate–and that includes a fancy dinner out. It’s important to keep your eye on your goals, but also not forget that there are good times to be had. Being open to change and having regular financial check-ins ensures that money problems get resolved. Can Making a Will Save Money? Do Consumers Know the Score Behind Credit Scores? We May Not Always Be Together…Am I Prepared Financially? How Much Should You Save in Your 30s?